Supply of fresh water to the ships at berth…..USD 7.15 per 1000 liters subject to minimum supply of 50 Mts. Service charges equivalent to 50% of the charges prescribed for supply of Water shall be levied on the water requisitioned and not taken by vessels provided the quantity not taken is more than 10% of the quantity requisitioned by the vessel. i) Covered space next to Docks/jetties…100 Sq.Mtr per fortnight or part thereof @ Rs. 12,680/- and thereafter @ Rs. 25,360/- from second fortnight onwards. ii) Covered space behind Docks/jetties…100 Sq.Mtr is @ Rs. 25,468/- per month or part thereof. 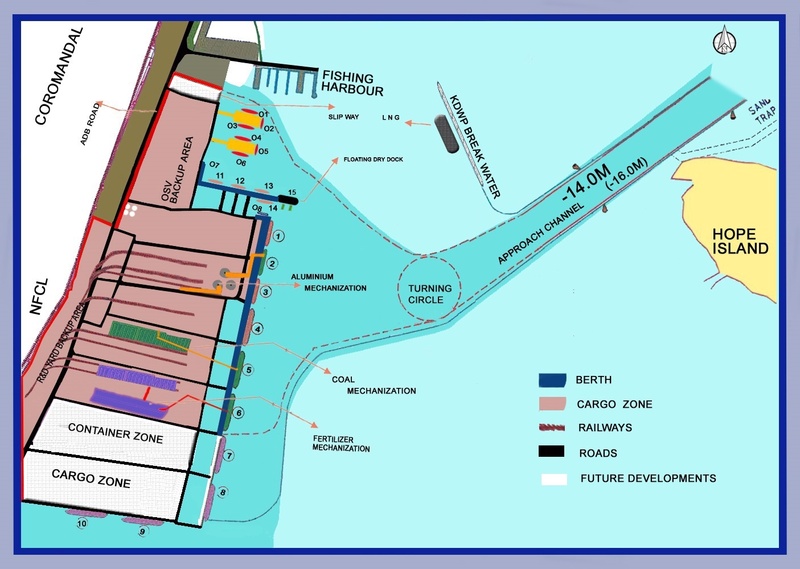 iii) Open space next to docks/jetties for Bulk/General cargo …100 Sq.Mtr per fortnight or part thereof @ Rs. 4,170 /- and thereafter @ Rs. 8,340/- from second fortnight onwards. iv) Open space behind docks/jetties of North, Middle & South berths (i.e the land available between west side of these berths till East side of ADB road) for bulk cargoes is @ Rs. 51.50/- Sq.Mtr per month or part thereof, upto stacking level of 5Ts per Square Meter. vi) Open space behind docks/jetties of North, Middle, South, Fourth, Fifth & Sixth berths (i.e. the land available between west side of these berths till East side of ADB road) for General cargo other than offshore material is @ Rs. 64.00/- Sq.Mtr per month or part thereof. vii) Open space outside (i.e. the land available in R&D Yard on west side of ADB road) for bulk cargoes is @ Rs. 33.00/- Sq.Mtr per month or part thereof. viii) Open space outside (i.e. the land available in R&D Yard on west side of ADB road) for general cargoes other than offshore material is @ Rs. 49.75/- Sq.Mtr per month or part thereof. ix) Open space for Off shore material within port other than next to Docks/jetties is Rs. 76.00/- -Sq.Mtr per month or part thereof. x) Open space outside (i.e. the land available on west side of ADB road) for Utilities where the temporary structures are constructed by port users for purposes other than offshore material is @ Rs. 33.00/- Sq.Mtr per month or part thereof. xi) Concrete Open Yard space for Bulk/Break cargoes inside port area (Other than Jetty areas) is @ Rs. 94.50/- Sq.Mtr per month or part thereof, upto stacking level of 5Ts per Sq Mtr. Note: All Storage Areas being allotted to customers are to be invoiced in advance of the month. 1. Fortnight means a period of fifteen days and a month means 30 days. 2. Allocation/allotment of areas either covered/open inside docks or outside the docks is purely based on availability and at the discretion of KSPL. The minimum chargeable period of license fee payable is 15/30 days as detailed in tariff head even when the occupation is less than a fortnight/month. 3. Any occupation of areas without valid permission in writing from KSPL is to be treated as unauthorized occupancy and is subject to penal charges as leviable by KSPL. 4. For delayed payments beyond KSPL norms, KSPL reserves the right to levy penal charges and impose penal interest for outstanding amounts. 5. In all cases of delayed clearance of cargo, KSPL reserves the right to levy penal License fee for storage of cargoes and additional Penalty charges in additional to expenses for shifting/removal etc. 1. KSPL shall have lien on the goods for the recovery of rentals/any other charges. 2. KSPL reserves the right to evacuate any stacking area by giving seven days notice. In the event of the occupant not vacating the land after due notice, KSPL shall make arrangements confiscate/to shift the cargo to another location anywhere, at the cost and risk of the occupant. Website by Sir Speedy, Hyderabad, India.